Golden Apples: What a Week. All sorts of good stuff to report. (I am working hard to focus on the good stuff). First—Striped socks completed. See? 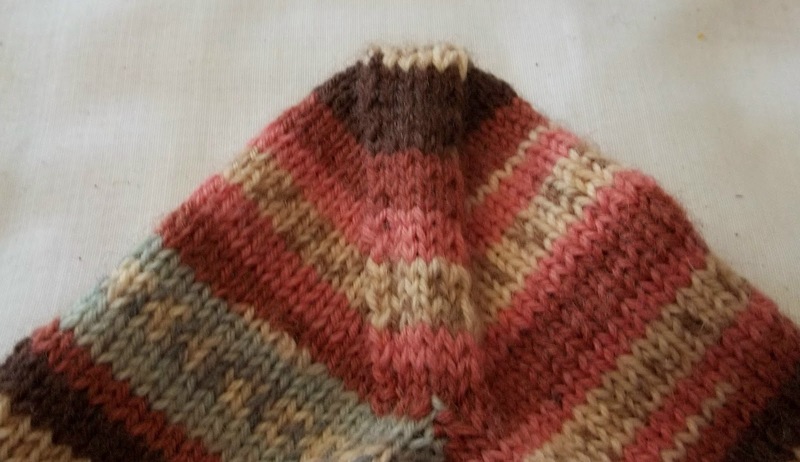 All knit, and finished too. This is FO 3 for this week. Which is pretty amazing. I don't think I have ever finished 3 things in a week before—not even when I went on a kick to clean up and finish up a whole bunch of UFO's. Getting back to the socks. 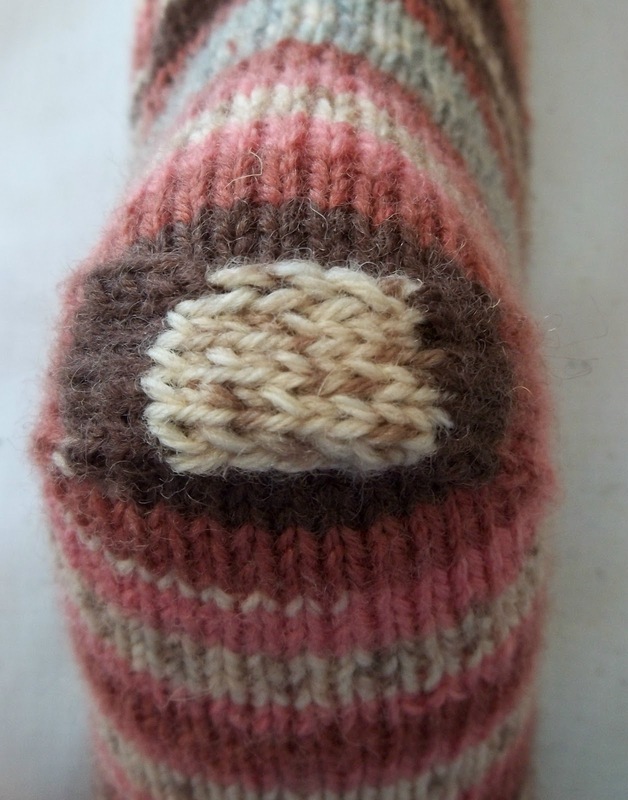 They are a pretty generic socks—with just a few detail to make them special—The garter band as mitered corners –and there is a slit at the out side “seam”.--which isn't very evident in the images. The heels are afterthought—done with a bit of care—an effort was made to have the stripes match-- at the back of the heel--(not, of course on the sole—it's pick on or the other), and have a banded construction, as do the toes. Banding as a way to finish a heel is a bit tedious to do--but well I did it anyway. With very simple socks, I think its important to have some special details. 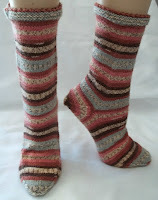 The yarn is basic stuff—Kroy Jacquard sock yarn in the Cameo color way. Then last night, I cast on some stitches for my Peacock (painting) Shawl swatch- Just 3 feathers—to experiment with -they don't look like much now, but LOOK at the time! Less than 4 weeks till the wedding and the shawl still needs to be painted and blocked, my dress made, and my daughters wedding coat made. I had better get cracking! Any other good thing I did this week was laundry. 7 loads of laundry. A remarkable amount of laundry.. but more remarkable--All of it has been washed, dried, folded and put away! OK, well not the socks, they are were set out flat to dry, and still need to be put away. But all the other stuff is away. A big bag of clothes (too big for me now clothes) have packed for recycling, too. That freed up a lot of space for putting clean clothes away. Seven loads of wash! Well--some of it was really house cleaning—Floor mat 1 (of 3) got washed. It was a small 100% wool rug—in bright yellow. OK, not the best color for a floor mat by the entrance door, and it looked awful--filthy, and the bright yellow had been sullied to a dull dingy greyish yellow. I figured machine washing it couldn't make it any worse—and might make it better. It survived—and looks better. Not perfect—so at some point, I will need something new—but I love these yellow mats. Next time I do laundry, the second one will get washed. Right now, it looks worse--sitting as it is next to the newly cleaned one. But that won't be for long. These mats are a perfect match for my yellow computer alcove--(it's not quite a room—size wise or legally (no window) and just inside the front door and the first line of defense The third mat, (by the terrace door) is machine washable—and not wool, so there is no question it will look better for getting washed. Other cleaning (masquerading as laundry) includes some curtains and throw pillows--and these need to be washed, too. So I will be doing a good bit of laundry for the next few weeks. Another load of wash was really sewing. At the beginning of the summer, I bought and made some dresses and skirts out of cheap precut lengths—of 100% cotton. And totally forgot, 100% cotton shrinks. The clothes still fit--Cotton shrinks more in length than width—(my width shrunk a bit, too, over the summer) But they are a little shorter than I planned. So I decided to plan ahead and get some of the remaining lengths of cotton pre-washed (and preshrunk)--so one load of wash was just clean fabric. So a half dozen pieces of pre washed cotton has been ironed, and put away. The next time I do laundry, a few remaining pieces will be pre-washed. Then when I get around to sewing some winter wear-- All of the 100% cotton pieces will be pre-washed and preshrunk and ready to go. While I had the iron out, all the newly washed clothes (made with the other cotton), got ironed, too. The last unexpected load (well not really unexpected—just seasonal) was the collections of Pool (beach) towels. There are just 6 of them (the oldest is over 25 years old!) but they are over sized—and 6 makes up the best part of a load of wash (2 half loads—one for the mostly white towels, another for the mostly dark ones). Some weren't really that dirty--but it makes sense to wash them before putting them away for the season. They are the last bit of pool stuff to be packed away. Finally, I got my vacuum cleaner fixed too. (It had a blown fuse- and hasn't been working for an embarrassing long time) I've been sweeping (with my swiffer) and vacuuming with my hand held—but everything really needs a good vacuum. I didn't actually get any vacuuming done (well one corner of one room) but at least now, I can. A much better week than I expected at this time last week. I am better, and things around the house are too. Oh my ears and whiskers - 4 weeks. Hurry. You are making me nervous.